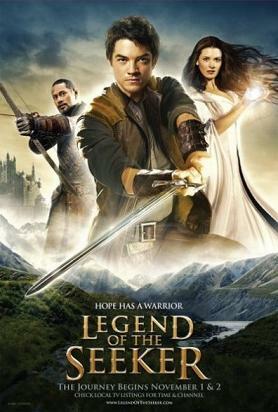 This week at SpockSoc, we’re starting off the second season of Legend of the Seeker, based on the Sword of Truth books by Terry Goodkind – this season is apparently based on the second and third books in the series. Don’t worry if you missed the first season – I’ll give a brief character recap before we start. Starting from this week, we’re moving back to Rex Vowels to Red Center G001, the Electrical Engineering lecture theatre – it’s the same place we were last session. Check out the map on our website if you’re uncertain. I don’t have official confirmation of this at the moment, but if it turns out we’ll be somewhere else, I’ll stick up a sign at Rex Vowels Red Center G001. Starting at 5pm Friday as usual. On a different note, since both myself and Vice President James are going to Japan for a holiday in a week and a half (wai! wai!) I’m making some changes to the schedule – essentially we’re swapping weeks five, six and seven with weeks nine, ten and eleven. Just a little heads-up to let you know – we’ll still be sending these announce e-mails each week like normal.